Water gardens add a new and unique dimension to gardens, and can be used in many different ways to create many different effects. Still water in a tranquil garden pond or pool creates a feeling of serenity and peace, while moving water in fountains, streams and small waterfalls gives a more dynamic feel to the garden, generating a sense of life, movement and sound. 1. Introduction: Scope and Nature of water features, water quality, plants & animals in water, etc. 4. Ponds, watercourses, bog gardens, dams –Design and Aftercare. Understand the nature and scope of water gardens. Identify and describe generic construction materials and techniques suitable for water gardens and pools. Select appropriate equipment for use with water features. Specify the design and construction of a pond or watercourse. Specify the design, construction and maintenance of a spa or swimming pool. Specify the design & construction of a Water Feature other than a pond or water course. Identity the water plants commonly used in water gardens. The scale and style of water gardens is almost limitless, ranging from small courtyard wells or water sculptures, to tranquil backyard goldfish ponds, through to large fountains, dramatic cascades and large formal swimming pools. Water provides a wonderful way to give your garden a special and unique dimension. The great thing about water is that it can be used in so many different ways, to create so many different affects. We can use it to water plants, keep the garden cooler, provide a drink or home for wildlife, to grow water plants, provide a reflective surface, to swim or sit in on a hot day, or even something for children to play in. 5th Decide on the surrounds - How will you landscape it? There are lots of things to consider, but perhaps the first thing is to ask yourself what sort of feeling or mood you want to create. Consider the following and select the "feeling" which you want the most. 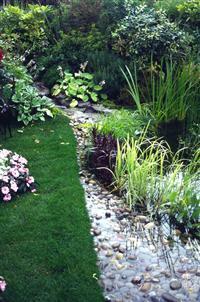 Do you want formal or informal ponds, straight or curved sides, well defined or hidden edges. We're all attracted to water in the garden, but often for different reasons. Before you create you create your water garden, consider what you want it to achieve for you. Is the water feature to attract birds, keep fish or other water animals, be a visual feature, be a sound feature, or for exercise and relaxation. Moving and splashing water brings a garden alive, and creates a feeling of excitement. Still water is serene and creates a feeling of peace. Water makes hot areas feel cooler. Even the smallest courtyard can have a water feature. There are many different ways of retaining water and each method has advantages and disadvantages. At one stage all water features were constructed of concrete, now there is a choice of ferro cement, fibreglass, PVC, liners or earth (dams). The choice is associated with whether the feature is being constructed on site, or brought onto site already constructed or partially constructed. Once the water feature is installed the surrounding landscaping can commence. When a pool or a spa is being constructed the area surrounding is usually trampled or covered in construction material, so don't be tempted to start landscaping prior to the completion of the pool. The type of water feature will govern the landscaping. The options of landscaping around a pool are endless. The pool can have a surround of paving, exposed aggregate, concrete, tiles, decking if there is a slope to give a level area or even a beach area. A beach area has advantages if you have small children. After the surrounding edge numerous styles of gardens can be created. Due to pool fencing regulations in numerous areas of Australia now, these must be considered when landscaping the surrounds. A tall tree suitable for a child to climb can not be planted next to the fence, as it will assist a child to climb the fence and have access to the water. Check you council by-laws prior to deciding on layout for your pool. Some fencing regulations even apply to any water feature if the feature is over a certain depth. When constructing ponds using concrete or ferro cement it maybe necessary to hide ugly edges which can occur. various materials can be used, overhanging rocks or paving, overhanging plants, or if a more formal edge of timber (eg. railway sleeper) or brick. In the shade, swimming pools never get very warm, but they don't get as cold either as pools in the open, particularly in cooler climates? Shade on the pool during the main heat of the day can extend the use of the pool. Due to the dangers of the sun people tend to avoid the sun between 10 am and 2pm. Shade can be provided by trees which do not drop leaves, or by umbrellas or pergolas. Pond life in a shaded pond might be different to one in full sun. Any plant placed near a pool or pond should be a evergreen or have large enough leaves that if they drop will be readily picked up by hand, rather than the small leaves that clog filters, discolour the water and make the water unsuitable for fish and change the pH of the water making the cleaning process longer and the use of additional chemicals. The plants should have non-invasive roots otherwise they will crack the pond or pool in the search for moisture.